Video games, tech stuff, music, and whatever else currently interests me. Happy (slightly belated) New Year everyone! Now that it's 2013, it's time to reflect back on the year that was 2012. Part of that for me is my annual blog post of my personal top five video games of the year. The following are my picks, in order from #5 to #1, for my favorite five video games that were released in 2012. After that, I've also included some honorable mentions and my biggest "letdown" video game of the year. So read on and enjoy! 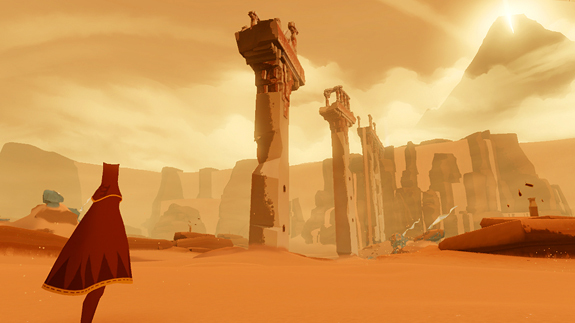 Journey is a game that's very difficult to describe to someone who hasn't played it. If you have a PS3, $15, an internet connection, and a couple of free hours, I would definitely recommend trying it out yourself. Gameplay-wise it's a fairly simplistic adventure game, but it's got amazing visuals and a great soundtrack (which actually won a Grammy). The game centers around your trek to a faraway mountain and the exploration that occurs during the journey. There's no dialogue the entire game, and no cutscenes or backstory given. You're left to insert your own story if you'd like, but the game is more about making your way and taking in everything that's around you. Journey's use of co-op was also something that was new and different from any other game I've played. You will randomly come across other players during your quest, and the only communication method you have with them is a sort of "ping" by pressing a button. That's it. You can't speak, send text, point, or anything else. You also can't choose to play with your friends like most games; any person you come across is a random stranger. But if you manage to stay with another player you can actually help each other out and (in my experience) start to form a sort of unspoken bond in helping each other. Like I said, it's a hard game to describe properly, so if you get a chance to play it I would definitely recommend it. The return of Master Chief. The end of Bungie and the beginning of 343 Industries. In my mind, this game had "letdown" written all over it. I wasn't even planning on getting it, but based on early feedback I changed my mind right before launch. And I'm glad I did. Halo 4 was a hit. Within the first fifteen minutes of the campaign I felt more invested than I ever did in any of the past Halo games (and I liked all of them except Halo 3). That really says something about the direction 343 went with this game. They kept all the action and combat, but they expanded on the core characters and made you actually care about them. The story was a good sci-fi story that wasn't overly complicated, and the Prometheans were much better enemies than the Flood (who I never liked). There were also a few vehicle levels which I thought were well-placed to mix things up a little bit. They were fun but they didn't overstay their welcome. My only complaint about the campaign is that I actually wish it had been a little longer. I finished the game in around nine hours on normal, but I'm not a Halo god and I usually take longer than most people to go through a game. Besides the campaign, the multiplayer was different but good. There's the "Infinity" mode, which is your normal multiplayer that consists of slayer, team slayer, capture the flag, etc. Here they definitely took a step towards being more like Call of Duty in that you level up your Spartan based off XP you get in multiplayer to unlock new weapons, armor, abilities customizations, etc. I always liked Call of Duty's multiplayer better for this reason (it's more like a little RPG in and of itself), so I was happy about this. The other multiplayer mode is called "Spartan Ops", which is a series of new missions they put out every week which are meant to be played co-op by up to four people. 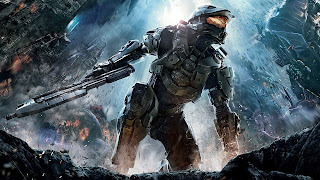 They continue the story of the game after the regular campaign with non-Master Chief spartans. These missions are if a little repetitive, but it's hard to complain about what basically amounts to free DLC every week. Overall, I was very impressed with Halo 4 and am looking forward to the rest of this new trilogy more than I ever looked forward to any Halo games before. There was some sort of problem I remember reading about with Mass Effect 3. Apparently there was some controversy about the ending of this game or something? People on the internets weren't happy I guess? I don't follow that stuff much. 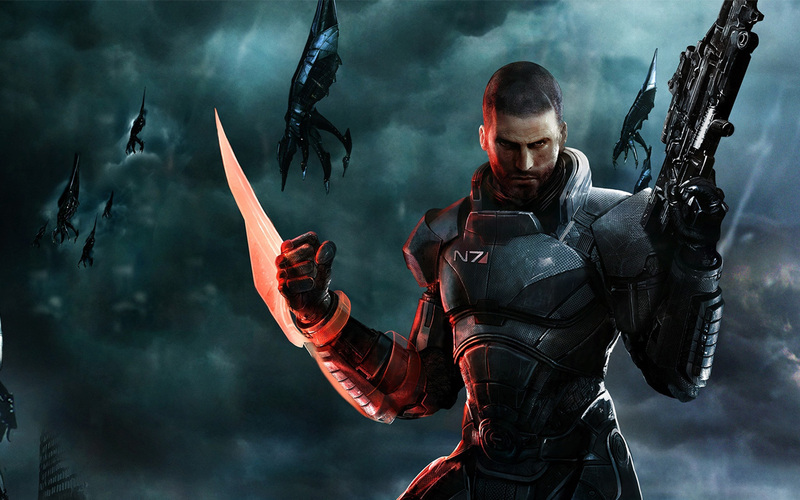 Seriously though, I loved Mass Effect 3. I thought it was and still think it is an excellent game. The problem was with the last ten minutes or so. I didn't hate the ending as much as most people, but there were some definite problems with it. The "Extended Cut" DLC which came out a few months later fixed most of the loopholes and added a little more closure, but it still was a little bit of a disappointment. But while the ending wasn't great, I thought the rest of the game was, and I'm not ready to trash the whole thing just because of the ending. The campaign was great and once again extremely well-written. Like the rest of the Mass Effect series, you are forced to make choices that affect your game (at least in the moment), and it was great to see all the old characters again, and meet a few new ones. As always with Mass Effect, the writing and voice acting were topnotch. 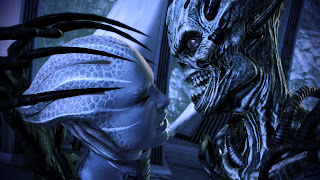 Mass Effect is so well done that you can't help but become invested in the characters and story, which is why people were so upset when it didn't have an epic ending with great resolution. Oh, and let's not forget about the gameplay improvements. Combat went from being kind of a chore in Mass Effect 1 to "fun" in Mass Effect 2, and ME3 took it to an even better level. The combat is both strategic and action-packed, you need both skill and smarts (to manage your powers and squad mates if you choose to do so). The cover system, which is key in 3rd person shooters, was also improved, along with giving you a ridiculous amount of customization over what guns you take and how you equip yourself. Oh, and let's not forget about the multiplayer, which wins the "No One Thought This Would Be That Good But Me And My Friends Wound Up Playing It Non-Stop For Months" award. Yeah, it was that fun and addictive. Without getting into it too much, it basically took the best RPG elements from Mass Effect 3 and combined them in a co-op horde mode game. And you could play as all the races. It was awesome. 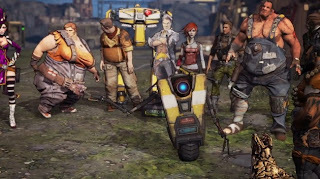 Like sequels often do, Borderlands 2 took all the good stuff from the first game and expanded on it while adding a few new things. I always liked the graphical style of Borderlands and this game kept it going. Also, Borderlands has become a standard in co-op games, which is definitely a plus (unless you have no friends I suppose). If you're playing Borderlands alone, you're doing it wrong. As always with the Borderlands franchise, the characters and dialogue were great (and by great I mean hilarious). Last year in my Top 5 I said that Portal 2 was the funniest game I'd ever played. Borderlands 2 probably surpassed that this year. Claptrap is the greatest character ever created in any form of media or literature throughout human history. He makes the whole cast of the Godfather movies look like bad community theater actors. A bunch of other characters from the first game also make an appearance and the new characters are all great too. While some of the quests get a little repetitive, the overall story is good and the gameplay is top notch. While I beat the game, I'm behind on playing the DLC (and there's still more coming), and I still haven't gotten a max level character yet, so there's definitely replay value and a lot of life to this game. Something must be said for Dishonored, which is the only new "franchise" to be on this list from 2012 (Journey was a new IP as well, but probably won't become a franchise the way Dishonored will). You've got to give props to a game that is new and innovative but is still this good. I'm normally not a fan of stealth games, and you don't even have to play Dishonored like a stealth game if you don't want to, but I did anyway and still really enjoyed it. I think that speaks volumes for how well it's made and how interesting the game is. The gameplay is great, the story is good, and the world of Dunwall (where the game takes place) is amazing. 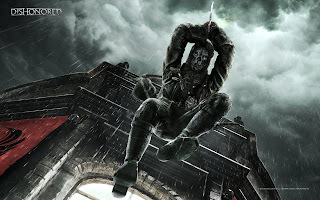 I've often said that Dishonored is like a mix of Half-Life 2, BioShock, and Assassin's Creed, which are all hugely critically successful games. That's very high praise, and while Dishonored isn't a perfect game, I think it deserves it. Besides all the great qualities of the game I listed above, the other great and unique thing about Dishonored is how many options they give you for approaching each different situation. You can finish the entire game without killing a single person if you wish (there's even an achievement for doing it). While that makes the game much harder (I didn't have the patience to do it that way), it just shows you how many different options you have in the game (you can also kill almost every person you meet if you so desire, not that I endorse that). The level of control you have approaching every situation, the mix of combat and stealth, and the RPG elements make the gameplay and replay value outstanding. Mix that with a setting, atmosphere, and story that is reminiscent of Half-Life 2 and BioShock, and you have my Game of the Year for 2012. X-Com: Enemy Unknown - Something old and something new. I played some X-Com when I was a kid (it was probably slightly before my time), but I remember it well enough to know that this is both a great remake and a great game in its own right. It's also nice to see a well-made turn-based squad strategy game, as that's a genre that's hard to find nowadays. This game is addictive and extremely deep. Diablo III - Since it's pretty much been beaten to death online I won't go into this too much. Diablo's co-op was great, and levels 1-59 were all pretty good (I did have to use the gold auction house a few times in there but it wasn't too bad). But once you get to level 60 and Inferno difficulty, the game's just not fun anymore. By then you're on your fourth playthrough of the exact same game, and to progress you have two equally unattractive options: farm the previous difficulty or Inferno Act 1 for days to try to find some halfway decent gear (tip: you probably still won't), or go spend $250 (that's not a typo or exaggeration) per item on some ridiculous items in the real money auction house (or RMAH). Yeah, thanks Blizzard, but I think I'll pass on that and just leave my character suspended in Act 2 of Inferno for the rest of time. Can't wait for Heart of the Swarm though!!! And there's my list for 2012. While there were some good games that came out (see above), I feel like the video game industry is starting to slow down in anticipation for the next generation of consoles from Microsoft and Sony (which will probably be out either late this year or early 2014). And the Wii U doesn't really count, because it's on around the same level as the 360 and the PS3, which have been out about 7 and 6 years respectively (can you tell I'm not a big fan of the Wii U?). Games now are starting to be made for the next consoles, so there's probably going to be a lull in the number of games for 360 and PS3, which soon will be "last generation" consoles. I think to some extent that's what happened last year, and it will definitely be more noticeable this year. That's just my prediction though. Stay tuned for my upcoming list of games I'm looking forward to in 2013 (and beyond)! As always, I would love to hear your thoughts on my list or even your own list. Any comments, feedback, likes, shares, retweets, +1, high-fives, "Sup girl? "'s, or whatever else are all greatly appreciated!